I am back… sorry about the radio silence last week… I was kind of forced to take a little break but we are now back on-line and ready to go… starting with Paper Piecing Monday miniature style. The Portland Modern Quilt Guild is currently taking part in some miniature quilt challenges, so I just had to give it a try. 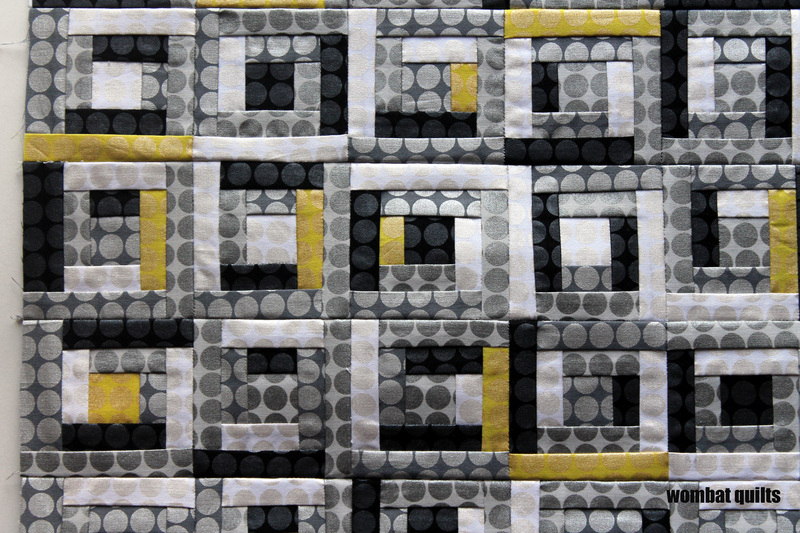 Because of the size of the quilt blocks usually used in these quilts, precision is incredibly important. Even the slimmest of miscalculations can cause big issues when you are working at such a small scale, unless of course, you work with a paper piecing pattern. Of course I had to use one of my fave fabrics, Michael Miller’s Mirror Ball. It was just perfect for this challenge and worked well with the small scale block. 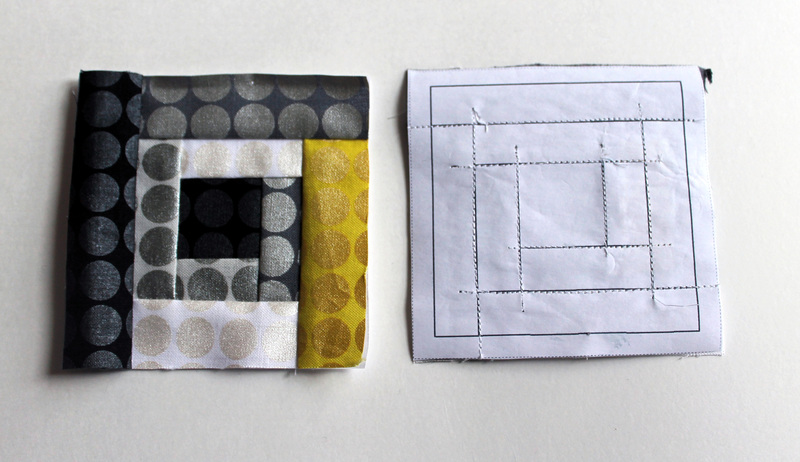 You can find the paper piecing pattern I used here…. miniature log cabin pattern. The blocks came together really quickly and my final quilt is 15 inches by 15 inches square and now all I have to do is work out how I want to back and quilt it. I think that’s the only way that I would attack miniature piecing as well. Paper piecing solves so many problems! It did make it easy to tackle. I can not imagine having to be precise enough to make these blocks without paper! Welcome back, I was just wondering if you were OK, and missing my regular dose of Wombat! I do love those Mirror Ball fabrics, and the black/silver/gold/white combo works so well in the structure of mini log cabins. 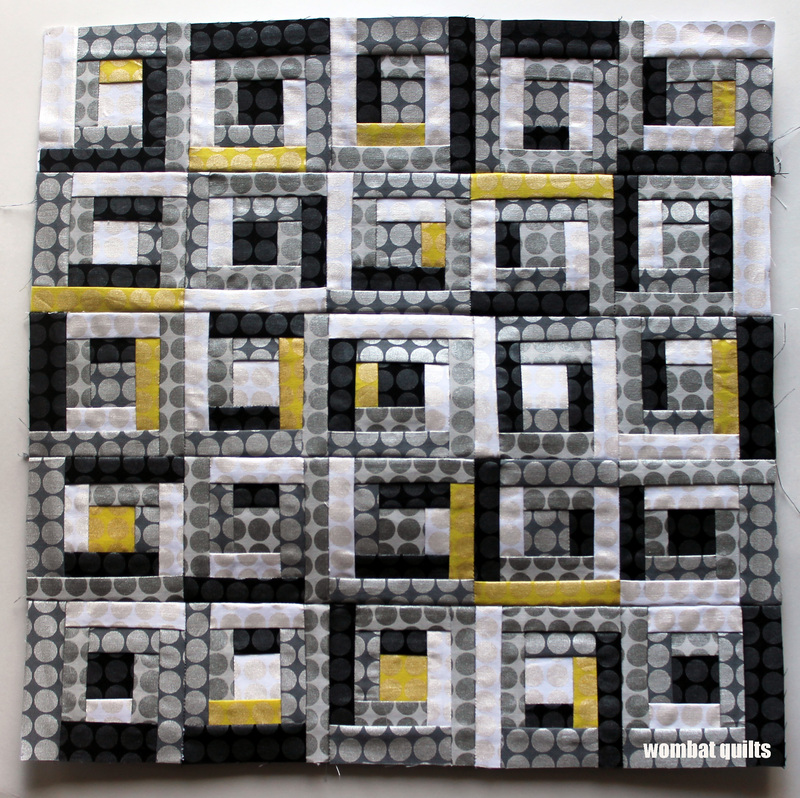 I’ve always been a fan of using a very loose, splashy overall quilting design when the top design is very structured, it adds an extra dimension of light and shade. But this is so lovely that anything you decide will work! I have been pondering how to quilt it. Part of me wants to hand quilt part of me wants to do simple machine quilting. If it’s a question of time, this quilt is small enough to knock off simple straight line quilting in a morning, but if you’ve got longer, hand quilting’s a very different look and gives such a nice soft bubbly texture. I’ll be interested to see which you decide to go with. I love mirror balls! And I love them especially in these blocks! There’s never the need to apologise for taking a break. I want to suggest yellow for the back, to pick up the cheery accents of the front. Oh I love the idea of using the yellow on the back. I even have extra Mirror ball. Mirror ball yellow? Even better! Inside joke….How coincidental! I love this block! 🙂 Thanks for being willing to share you pattern with us! I needed a little log cabin. Timing. Amazing! I love being helpful. What are you going to use mini log cabins for? what?! what is this gorgeousness. every week i think you can’t top last week- and then you do. this is adorable. i want a pillow in this now – leftover chicopee scraps?! perhaps!!! Maybe we need to do a pillow swap? I just realized that I think I’m mixing you up with another quilter I follow who ALWAYS makes tiny mini blocks!! Either way, great job with these minis! They are awesome and inspire me to try an itty bitty quilt, too! I have only done a few small block before 3 inches or smaller). My blocks are usually between 10 and 12 inches… With nearly all my paper piecing stars being 12 inches. I love the mini plus love paper piecing – looks great! This is so beautiful and the pop of colour just makes it even more remarkable. I am mighty scared of paper piecing. Eek. These are the cutest things ever!!! And all together they are amazing!